Our Earth is degenerate in these latter days; bribery and corruption are common; children no longer obey their parents; every man wants to write a book and the end of the world is evidently approaching. Marvelous as it is, the quote may be apocryphal, as Genta noted in his recent talk at the deep space conference in Aosta. In fact, I suspect it is, unless the bit about every man wanting to write a book was literally written ‘every man wants to keep his household accounts on a clay tablet’ or some such. But whatever the case, the quote echoes similar sentiments found throughout history, thoughts that evoke a golden age when things were just plain better than they are in the present and the future did not seem so dark. Which is not to say we don’t have serious problems that could limit our civilization, or even end it. The Assyrians didn’t have to cope with nuclear weaponry, or biotechnology, or the possibility of nanotech developing in unforeseen directions. Genta dismisses none of these problems, but his talk at Aosta made the point that immediate perils are not the best way to promote space exploration. If, in other words, we cite commodity shortages or climatic changes as a rationale for getting humans off-planet and thus saving the species, we run the risk of losing credibility if our predictions are wrong. 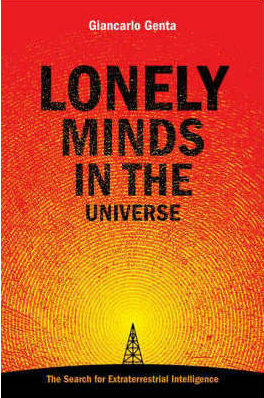 Image: Giancarlo Genta’s Lonely Minds in the Universe (2007) examines our view of extraterrestrial life as it has evolved over time, with a focus on historical accuracy that illuminates the discussion and challenges many stereotypes. While it is certainly true that there are limits to the development of the human species on this planet, these limits seem to be still quite far from being reached. The proposers of the space option should thus promote it as a great opportunity to improve the standard of living of all human beings and not as a last resort attempt to avoid an impending ruin. The use of nuclear energy for space propulsion in Earth orbit and beyond is just a matter of political will and only marginally of technology: sure, technological advances are required, but after more than 50 years of theoretical studies the ideas are clear and what are still needed are just details. Nuclear-thermal propulsion was demonstrated on the ground in the 1970s and could be used by now for deep-space propulsion. It is true that the performance of such systems can be improved well beyond those demonstrated up to now, but what we have could allow anyway a large improvement if compared with chemical propulsion. What we really need is to have nuclear powered spacecraft for interplanetary missions, even if their performance were only marginally better than those of chemical propulsion: we need to gain experience in building and operating nuclear systems in space and to make people used to this technology. Performance of nuclear thermal propulsion will improve in due course, but if we wait to start until improved systems are available, everything will be delayed indefinitely. Image: Giancarlo Genta discussing Moon-rover prototypes at the Mechatronics Laboratory of the Politecnico di Torino in Verrès, a lovely town in the Aosta Valley. Photo by Roman Kezerashvili (New York City College of Technology). Anyone advocating nuclear propulsion in today’s climate of opinion is sure to have a fight on his hands, but Genta believes the time for this fight is propitious. We’re already seeing signs that in the power industry, nuclear options are making a comeback in terms of public acceptance — the phrase ‘nuclear renaissance’ is in the air in some quarters, indicating that we may be ready to move past the era of kneejerk rejection of the nuclear idea. Funding remains a problem, but we come back again to having to sell our future in space one mission at a time, a laborious task but an essential one. The space option is a long-term perspective, which will naturally be implemented in due time. Perhaps it is hard to accept that progress toward space must be done step by step, but trying shortcuts may be dangerous. In a situation of scarce funds a hard competition between missions and technologies should be avoided. The efforts should be concentrated in areas that may prove to be enabling technologies, even if this may result in postponing some important scientific results. There is no more important enabling technology than one that would get us to low-Earth orbit cheaply. Genta noted the space elevator concept in his talk but expressed concerns about the size of the investment needed to build it. In any case, a space elevator raises its own safety concerns. He sees nuclear technology as an achievable solution to the low-Earth orbit problem that should not be put off in hopes of a vastly more expensive future solution. Political will is a tricky thing to summon, but making a sustained, long-term case for space as a key player in our economic future may help overcome the obstacle. The paper is Genta, “The Nuclear Renaissance: From the Power Industry to Space Exploration?” in Proceedings of the Sixth IAA Symposium on Realistic Near-Term Advanced Scientific Space Missions, Aosta Italy (2009), pp. 13-18. As with other papers from this conference, this one will appear at a future date in Acta Astronautica. From the “The making of the atomic bomb” by Richard Rhodes, great book. I like this quote, still 100% true in 2009! The New Horizons spacecraft on its way to Pluto for eg uses a Radioisotope Thermoelectric Generator (RTG) which produces 30VDC @200W (in 2015), doesn’t even have batteries onboard! I wonder, would it have been cheaper to put RTGs on the International Space Station instead of using the big solar panels? Sadly, I don’t have much hope for any political leadership for much needed change in the US anti-nuke phobia. So far the President has made what I see as excellent NASA Director and Assoc Director appointments, but the political will to anger a political base containing of most of the anti-nuclear environmental radicals isn’t there. I think there is only one option for the future of large scale nuclear space propultion because of the political climate around nulear. The way forward is a national space elevator, we set a 20bil budget for the elevator and match that for nuclear propultion research. Give it a 10-20 year finance plan while at the same time creating TONS and TONS of high tech jobs to soak up the smartest people and encourage science education throghout the nation and the world. First we make it easy to get the nuclear material out of GEO with the space elevator then we need not worry about the enviromental ramifications and/or public push back in the event of a large scale disaster. I see nuclear fission and/or nuclear fusion as one of the keys that can unlock true interstellar travel with appropriate fueled weight to dry vehicle weight ratios for nuclear powered rockets, fission or fusion fuel beamed mass sail rocket crafts, linear fission and/or fusion fuel pellet runways powered craft, cumnlinear fission and/or fusion fuel pellet runways powered craft, and improved ISR craft . Science fiction contemplates proton fission wherein the binding energy of the quarks within protons would be released in such a manner that quark bombs would be possible that all almost as hoih in mass specific yield as pure matter/antimatter bombs. Mini bomblets based on such as yet fanciful techology would make for outstanding Project Orion Craft analogues. It is even possible that additional nuclear forces might be discovered at the LHC when it resumes operation later this year or early next year. How we could use the associated nuclear energy is anyones guess, but such might come in very handy for manned star ship propulsion. The public needs to be made aware that nuclear energy in general can enable us to begin a glorious, and perhaps eternal venture ever farther out into the cosmos. I believe that Giancarlo Genta is correct in his thinking. As for Leo Szilard’s comments back in 1932, I feel that he could not be more correct. energy extraction and use, especially fossil fuels. 5,000 miles before needing a fuel stop. electric in the literal dust in terms of economy and “greenness”. than to propel humanity to the stars with it. I like the idea of a space elevator to bring nuclear fission fuel up from the surface of the Earth. A large scale 10 to 20 year finance plan for such would be awesome. If we can finance the development of fission and/or fusion powered space craft, my guess, is that the Captain or Skipper of a human crewed, human designed, and human constructed star ship could radio back to Earth, while embarking on a 15 to 20 year mission to Alpha Centuari, “Under Way On Nuclear Power” with a mission star date by or before 2050. Something has just got to unite our race, and bridge cultural, ethnic, religious, and political bounds, and I feel that manned interstellar travel is the key here. If you or someone means it really seriously with nuclear power, he should invest in finding a cure for radiophobia. Otherwise hordes of luddites will go on rampage as we saw when germany started to transport ists nuclear waste for reprocessing. is one of the most toxic elements known to man. uranium is a close second. we should not be so quickly blinded by one technological benefit and ignore dire consequences of any failures or disasters. the danger cannot be disregarded. i would proceed very carefully indeed. optimism must be tempered with practicality. safety first. Of course nuclear power can come from fusion too. If Dr. Bussard’s IEC fusors prove as light-weight as he imagined then fusion could easily power space-planes or space-elevators. I found an old paper by Hans Moravec on non-synchronous skyhooks which I’m looking forward to re-reading. While such things aren’t so effective on Earth, due to atmospheric drag, they’re eminently practical on every airless and nearly airless body in the solar system. Arthur C. Clarke once said (my paraphrase) that nuclear energy not only gives us the means to travel to other planets, but also the imperative to do so. Selling Space for something other than the “too many eggs in one basket” reason is good to do, but that necessity of broadening the human habitat is always there. I remember reading an account of either some general, active duty or retired, or some physicist, I cannot remember which, who stated that mankind has learned to harness the power of the cosmos, in reference to the sucessful test of the hydrogen bomb. Since hydrogen is the primary visbile matter constituent of the universe, with Helium a close second, we have before us an essentially infinite supply of fusion fuel at our disposal. In the coming trillions of years plus, I would expect that we can invent and construct over more extensive star ships, and ways of marshalling ever more fusion fuel for our technologies, which could have ever greater power outputs. If hyperspatial dimensions exist that are large, and independent or semi-independent, but which are not the same theoretical compactified dimensions of string theory, perhaps we can bring in hydrogen fuel from these higher dimensions such as by microscopic wormholes in the event that macroscopic wormholes prove intractable to construct. The point is that fusion fuel and nuclear energy in general, is just waiting for us to tap it in a grand exodus out into the cosmos. With respect to our universe at the very least, hydrogen and presumably U-235 and U-238 is everywhere, from stellar bodies, to planets and moons, to comets, and interstellar and intergalactic dust just waiting to be sequestered. Atomic propulsion does not have to be an unattainable “100% reliable”. Nukes should be used in space, but to get there they first have to be launched from the ground. The urainium fuel for a fission rocket needs to be encased in a shield that keeps it intact on re-entry. There will be no severe contamination of the Earth. Once in orbit, the rods can be inserted in the space vehicle for operation outside the atmosphere. Mike, no offense, I would strongly suggest you should get your radiophobia cured. All dangers you write about are grotesquely overestimated by your ireational fear. Plutonium the most toxic metal and uranium the close second ? Fail. You mean radiation poisoning ? Well. polonium 210 is like 6 orders of magnitude worse. First. Plutonium would be most likely not used at all. Highly enriched uranium in zircon encasing would be. And the stuff is so though that it would make it all the way to the surface without a scratch. Second. the failure rate is a direct consequence of working at the limits of what is physically possible with given materials. With order of magnitude more Isp You can afford yourself a comfortable safety margin. Third. Even if something bad happens, earth is huge and the stuff will be diluted to insignificant concentrations and most likely sink to the ocean loor altogether because most of the launch trajectory is above ocean. that is ridiculous. 100 % reliability is physically impossible like perpetuum mobile is. We would do nothing at all if we demanded 100 % reliability. And would (almost) 100 % safely die from apnea because neither breathing is 100 % safe. You show clear signs of irrational fear of radioactivity – radiophobia, and you should definitely do something against it before it overwhelms you and causes you to try to suppress the most powerful technology we have. And that is certainly not a 100 % safe course of action. I don’t think it’s going to be new technology that is going to solve our current problems of access to space. Space access, at the moment, suffers from the chichen and egg problem in that its high cost keeps the volume small and the small volume precludes investment in new technologies to bring the price down. The best approach would be to use as much off-the-shelf technology as possible to produce a simple system of reusable or partially resuable boosters to bring the cost down as much as possible. If we can get our launch-to-orbit costs down to around $1000/lb (Euro 2000/kilo), then we will reach a breakthrough piont where we can be a lot more relaxed about satellite wieght, which will enable the use of off-the-shelf, mass produced items to be incorporated into spacecraft bringing their cost down dramatically. SpaceX’s Falcon rocket is on the cusp off this. Note: any system like this will have to be developed for under one billion dollars given that initially 10 launches a year is all you can expect. Either that, or a substancial portion of the cost is going to have be written off by the government. Even when we get cheap-to-orbit transportation, getting elsewhere is going to still be expensive. Imagine for the purposes of this exercise that we have a cheap-to-orbit space craft that costs as much as a 747 to make but carries one-tenth the number of passengers. (This I feel is an optisitic but reasonable assumption.) This craft may be something like the Skylon (http://www.reactionengines.co.uk/), or a scramjet or maybe even an atomic powered vessel. Now let us assume there is a craft with a similar cost/passenger ratio that gets you to the moon from orbit. Its turn around is going to be one week, which is going to bump the ticket price by a factor of seven. Add your ticket to orbit an other ancileries and going to the moon and back is going to work out at approximately 10 times the price of going to orbit. $200.000 is about the price that Virgin is going to charge for its suborbital flights. It will be interesting to see how many takers they get. Now lets assume, we have a Mars craft with a similar cost to passanger ratio as our orbital craft. Even if it is a 200 MW nuclear vessel with high ISP drive that gets us to Mars in 30 days, with the way planetary orbital alignment doesn’t always match up, you would be lucky to get two return flights a year out of your craft. If you can only fly a 747 twice a year and with one-tenth its passanger load, you are going to have to charge a lot for tickets. Working off the same ratios in the case of the Mars craft would mean a ticket price of $5,000,000, which is in the same order of magnitude that the Russian’s currently charge tourists to get into orbit. As for nuclear propulsion, the holy grail would be a fission-fragment rocket which avoids the wasteful (Isb-wise) process of producing heat to warm a propellant by using the fission products directly as reaction mass. You don’t want to use such a thing anywhere within earth’s magnetosphere, for obvious reasons, but with an Isp at least 3 orders of magnitude above chemical rockets, a FFR would even be apt for interstellar distances. What if we could somehow get an entire unfired and fully fueled Saturn V rocket into earth orbit? How far into outer space could we go? How fast could we get there? I think we should bring back the Saturn V and update its computer systems to modern standards, then set about building a few of them in Earth orbit. I would pay money to see that. I’m betting we could get to Mars in a couple weeks that way. The trick is getting it into orbit but I’m thinking we have a boatload of helium on tap. Let’s attach hundreds or thousands of helium balloons to the components and just float ’em up there. The space station could be used to house the workers who’d put the rocket together. Zero-G robots could be used as well. It’s time we stop reinventing the wheel. The Saturn V was good enough for Neil Armstrong, it’s good enough for me. I will definately read the paper at the link you provided tomorrow after I catch some sleep. The fission fragment drive concept has fascinated me ever since I first heard of it about 3 decades ago. I am all for investment in Heavy Lift Chemical Rocket Boosters. I think that the ARES V booster will be able to loft a whopping 275 metric tons into LEO if I am not mistaken. Once they get the cost of this platform down, my hope is that its huge capacity will be a selling point. I want to see one of these babies launched at night. Even the power of this rocket from an intuitive experiential standpoint boggles my mind. When I cart my 45o pound body up the steps, I think, my God, this is only 0.225 tons. When I imagine a system, with a fueled weight of perhaps 4,500 metric tons, and how the final maximum payload will be traveling at over 17,000 MPH, figure in the (1/2)m(v EXP 2), and it amazes me what we can do with chemical rockets. Now nuclear fission rockets with an Isp of perhaps 500,000 or 1,000,000, or three orders of magnitude greater than chemical rocket! Now that rocks! Going back to the moon is a redo for sure. But if they set up a permanently manned outpost as planned during the early 2020s, I will be overjoyed You are invited to the big cookout I am going to have when we touch down on the moon again by 2020 as are any other practicioners of tau zero who want to attend. T_U_T, no offense, but if you expect to persuade anyone about the safety of nuclear rockets, you had better find a better argument than “you have a phobia”. If I were in a position of authority and you were asking for funding, my response would be “good luck finding the money”. If there’s enough uranium on the Moon, then we can circumvent most of the political issue by launching nuclear based spacecraft from there. As many as the merits of Saturn V were, it was based on old materials science and old control systems. Updating it would be basically rebuilding it. In many ways the Shuttle derived systems proposed for Ares I & V are Saturn V updated, especially the Main Engines. Also much of the direct engineering know-how locked up in the brains of the old NASA work-force from “Apollo” days is now lost as they age and die, so a lot would need to be “rediscovered” and redeveloped the hard-way. Both “Ares” and the alternative “Direct” proposals build on current engineering knowledge without the need to reinvent the wheel by going backwards. As for a fully fuelled Saturn V in orbit… can’t be done. You could place an empty S-II stage and a partly fuelled S-IVb stage into orbit (Stages 2 & 3), then try to tank them up fully. “Skylab” was basically a semi-loaded S-IVb stage launched into orbit by the lower two stages in what is called the S-21 Intermediate configuration. Not actually a Saturn-V just a Saturn derivative. Without additional SRBs it could orbit up to ~116 tons. An extended version with four strap-on SRBs could orbit a nearly fully tanked S-IVb stage. So what could a fully fuelled S-IVb stage do? Depends on the payload. Loaded with just an “Apollo” CSM it could add about ~4.85 km/s to the CSM’s burn-out of 2.875 km/s. That’s not enough to get you to Mars in a couple of weeks, but it might get the trip down to just ~70 days. However there would be no way to stop at the other end. Orbit the S-II stage fully fuelled and then stopping becomes a bit more possible, though with a heavy aerobrake at Mars. Only problem then is that the “Apollo” CSM isn’t equipped to support you for a trip that long. Throw on some solar panels and it’d have power, but it’d be very cramped and the oxygen and food supply could be getting short. A 13.5 ton Manned Orbitting Research Laboratory (MORL) would be more up to the task, but then you’d need a bigger booster. If you didn’t stop at Mars and just did a flyby, then the trip is just barely doable with a MORL pushed Mars-wards via a fully tanked up S-IVb with a CSM attached to provide Earth-return. They actually studied such flight profiles in the 1960s. I am greatly intrigued by this article as well as the discussion that it has spawned. I am currently in Chapter 6 of “Centauri Dreams” right now and greatly enthused. While I do maintain a high degree of enthusiasm for interstellar flight (both manned and unmanned), most of my passion is reserved for closer to home missions, the type which I myself might one day be able to participate in. The nuclear issue is a tough one. I see good points raised on both sides. While achieving 100% reliability, i.e. safety, with nuclear energy is a statistical impossibility, does that mean that it is not something to be strived for? We should not pursue an energy option with reckless abandon just because we are confident that technology has advanced enough to do so. On the other side of that argument, I completely agree that the technology has merit and I do not think we should shy away from it because of past incidents. In terms of propulsion alone, from what I have been reading in Paul’s book, nuclear energy is not as efficient a means of releasing energy as we would like. There are other, better technologies on the horizon. In terms of providing energy for the world, I think the risks of nuclear energy far outweigh its usefulness. Especially when compared to concepts like Space-based Solar Power, where we can beam unfiltered energy down from orbit in the form of microwaves in amounts that make current fossil-based and even nuclear-based energy supplies look pathetic. Solar is free and limitless and all we have to do is reach out and grab it. It can be incorporated into existing grids easily, and underdeveloped areas need not even bother to grid themselves in the traditional manner. Even wireless communications are becoming the preferred method of integrating these parts of the world. So, if nuclear-electric propulsion has a future in space, it need not have one here in the atmosphere. That may be the best solution overall, since getting past the Cold War and its mystique about nuclear holocaust will take more than a little time. Still, I agree that nuclear energy should and must have a future brighter (pun) than its dark past. Thought I’d drop by and add my two cents to this conversation. I’ve always been a big fan of nuclear power as well as space nuclear propulsion but realize it probably will take awhile to finance such a project. I always try to think of ways to finance this stuff outside of NASA because of their limited budget. A duel purpose reactor built in deep orbit may be the ticket. It could be financed by the defense department as part of a star wars type defense program or maybe as a power generating system to mico-wave power down to the Earth to be sold internationally to those timid souls that won’t or can’t build there own or maybe to rogue countries that we don’t want to have their own nuclear power. The other purpose would be as a modular engine for interplanetary space propulsion. Either the military or a commercial venture might in the future aid in financing such propulsion systems. It also could be field tested in the same manner. After X period of time the reactor could be deemed reliable for interplanetary propulsion. It would be only an orbit to orbit craft but it could provide the power by microwave transmission for ground to orbit craft like ion and plasma rockets. When the mission to Mars, for instance, would be over it could go back to its orbital system as a power generating system or for a country’s defense system that we might be able to sell around the world — again assisting in the financing of the project. If such a system shows profit potential then many might be built, some of which could continuously power spacecraft around the solar system for all kinds of cool ventures. For these reactors both fission, fusion, or hybrid reactors of some kind would all seem to be fine since they would be far enough out in orbit that contamination hopefully would not be a problem. Also countries such as maybe Russia, China, India etc. could be a joint venture partners to keep the production costs down for this orbital power generating station doubling as a interplanetary space propulsion system. Aside from the safety issue – which I think can be handled technologically – IMO the most important argument against terrestrial use of nuclear energy is that it constitutes a formidable waste of a limited resource. There is only so much Uranium in accessible place in the earth’s crust and once it’s used up it’s gone. This is in contrast to fossil fuels which can – at least in principle – be completely replaced by biomass (not as an energy source, mind you, as photovoltaics are an order of magnitude more efficient than photosynthesis, but as a raw material or energy carrier). Therefor, any use of nuclear power should be restricted for applications which actually profit from the formidable energy densities provided. Burning the stuff up in a stationary plant to drive a steam turbine is not one of them – unless the main purpose of the plant is to breed Plutonium to get more high-density fuel for high-power off-grid applications. Reasonable non-military terrestrial uses pretty much amount to ships and temporary power supplies of remote locations such as mining and construction sites – most of this uses would be rather small scale and could in principle be substituted by other means. Not so for a space craft: unless we get fusion power going, nuclear is the only option to move great masses (such a asteroid mining equipment) around at reasonable velocities. If we waste our local stock of uranium before we are able to bootstrap a space industry and mine it from asteroids in quantities, we might remain landlocked on this planet forever. I’m not sure nuclear rockets in the Earth’s atmosphere are a good idea. Even if you manage to get started in the first place, I suspect the first accident would likely overwhelmingly turn the public against you. Fundamentally I’m not sure it’s even worth developing such technology. Nuclear rockets beyond Earth on the other hand might be more acceptable (but would currently be banned under various international treaties). The idea that we can progress as a species by getting off the planet and populating new ones is the wrong lesson to be teaching people I think. It worked for the populating of America and Australia (if you are willing to ignore the consequences for the Aboriginal populations) but shouldn’t be extrapolated to be a model for the whole universe. Perhaps we should be considering progress as the development of our ability to live sustainably on our planet. This change in attitudes from consume-resources-and-move-on to work-together-and-with-the-planet is a bigger challenge than the details of space technology and requires more commitment, but would be real progress because it is progress of behaviour. Contrary to the false impression that current estimates of uranium reservoirs present, but we’re not going to run out of uranium on planet Earth for billions of years at realistic levels of use. What current “reserves” and “resources” measure is known and reliably estimated amounts of ore at current grades of extraction. But uranium can usefully be extracted at much lower concentrations and can even be extracted from sea-water. Also thorium is x4 more abundant than uranium and has been exploited at much lower levels than uranium, so there’s a lot more of it available. If uranium was used at 100% efficiency – which can be done with the right reactor design – then even the 70,000 tons or so of waste can be used as fuel. But most current reactors use enriched uranium which really only uses about 2-3% of the useful energy of the fuel. Historically this is because of the associated nuclear weapons that enrichment technology allows (though at 95% enrichment not the 3% used in power reactors), but countries with low uranium resources, like India, are rapidly developing thorium power systems. And thorium is used much more efficiently than enriched uranium. I’ve been reading – and blogging – about high-power reactors for spaceflight and it’s quite a challenge. The issues of space – no gravity and the need for radiative heat-loss – make high efficiency nuclear power systems problematic. Chang-Diaz, the chief developer of VASIMR, has pointed to the need for development of liquid/vapour/gas or even plasma core reactors to power the drives of the future that can take us to Mars in just 42 days (if we use it to stop) or 39 days if the crew aerobrake the last bit. The rest of the Solar System is even tougher to reach and will require reactors like nothing ever seen on Earth. I suspect no regulatory authority would allow civilian use of gas/plasma core reactors on Earth because of their ultra-volatile fission cores. Release of highly radioactive and very hot plasma would be frowned upon – though there are ways of rapidly quenching such. But radioactive gas in space is more like the ambient environment. James Essig above sent me a link concerning the Japanese discovery of uranium on the Moon. Mining and manufacturing using lunar materials would be a separate matter politically. Seemingly there would be less environmental opposition and greater political will for such nuclear projects on the moon and in space if transportation of such systems from Earth was not needed. An advantage space reactors for propulsion may have is that they may not have to be very big concerning the propulsion aspect. Only a small-output system might be used to get to the highest speeds because of progressive acceleration. On looking at your comment I realize that heat expulsion for a reactor may be a big problem in space. A large cooling system will be needed as well as solar shielding and maybe a very large quantity of circulating fluid might be used in some kind of a refrigeration (change in pressure) cooling system maybe manufactured from lunar materials. Thanks George for the encouragement. My argument is not one of avaiability per se but of economics: Just as cheap fossil fuel allowed for terrestrial industrialisation, cheap nuclear fuel is the key for the industrialisation of space. Anything you have to reclaim from seawater (except salt) is pretty much by definition not “cheap”. If 1876 when Nikolaus Otto invented the 4-stroke engine mankind would have been stranded with our current oil reserves, chances are the ICE would have remained a technical curiosity instead of the enabling technology for the second indutrial revolution and our technology would still be running on coal and steam power. Not because the oil wouldn’t be there but because it would be too expensive to allow for the huge initial profits margins necessary to create an economic boom which is a hallmark of any technological revolution (the other one being war). As an aside, I’m all for nuclear power plants IF their main purpose is to produce the isotopes for specialized applications (such as space propulsion or very small reactors) or recycling the waste of the latter. Basically it’s about not letting those valuable neutrons go unused. Burning Uranium (and this includes U-238) just for bulk energy generation is the same waste as large scale oil power plants. Anything you have to reclaim from seawater (except salt) is pretty much by definition not “cheap”. If used in a breeding cycle, uranium from seawater would add negligibly to the cost of energy. The cost would be dominated by the capital cost of the reactor facility; the raw uranium would be in the noise. Heck, uranium extracted after acid dissolution of average crustal rock would still be affordable. Abstract: Nuclear fission energy is considered to be somewhere between the holy grail, required to solve all energy worries of the human industrialized civilization, and a fast path directly to hell. Discussions about future energy sources and the possible contribution from nuclear energy are often dominated by variations of fundamentalists and often irrational approaches. As a result, very little is known by the general public and even by decision makers about the contribution of nuclear energy today, about uranium supplies, uranium resources and current and future technological challenges and limitations. This analysis about nuclear energy and its contribution for tomorrow tries to shed light on the nuclear reality and its limitations in the near and long term future. The report, presented in four chapters, is based essentially on the data provided in the documents from the IAEA (International Atomic Energy Administration) and the NEA (the Nuclear Energy Agency from the OECD countries, the WNA (World Nuclear Association) and the IEA (International Energy Agency). 103 page pdf, advanced propulsion study for the US Air Force made in 2004 prepared by Eric Davis of Warp Drive Metrics. Eric W Davis is an advisor to the Lifeboat Foundation. On pages 48-57, the recent nuclear thermal rocket variants are described. They are estimated to require 5 years of technological development and could have launch costs of $85-150/kg for a single stage to orbit vehicle. How Much Uranium is in the Solar System? We don’t know the composition of the asteroids or the objects in the Oort comet cloud or the Kuiper belt in great detail. One theory of solar system formation is that there are more metals in the inner solar system. That would mean most of the uranium is Mars, Mercury, Earth Venus and asteroid belt. There is an estimated 40 trillion tons of Uranium and 120 trillion tons of thorium in the Earth’s crust. Most of that Uranium is concentrated in the continental crust. The mantel has lower concentration of uranium, but there is a lot more mantel and mantel recycles out to crust. The solar heavy-element abundances described above are typically measured both using spectroscopy of the Sun’s photosphere and by measuring abundances in meteorites that have never been heated to melting temperatures. These meteorites are thought to retain the composition of the protostellar Sun and thus not affected by settling of heavy elements. The two methods generally agree well. The Sun is 332,830 earth masses. So if the Sun was 8 ppb (parts per billion) uranium, then 0.27% of an earth mass of uranium in the Sun. Researchers at NASA and the Department of Energy recently tested key technologies for developing a nuclear fission reactor that could power a human outpost on the moon or Mars. The tests prove that the agencies could build a “safe, reliable, and efficient” system by 2020, the year NASA plans to return humans to the moon. A fission reactor works by splitting atoms and releasing energy in the form of heat, which is converted into electricity. The idea for using nuclear power in space dates back to the late 1950s, when they were considered for providing propulsion through Project Orion. In the 1960s a series of compact, experimental space nuclear reactors were developed by NASA under the Systems Nuclear Auxiliary Power program. But public safety concerns and an international treaty banning nuclear power in space stopped development. Russia’s space agency chief is proposing to build a new spaceship with a nuclear engine. Reportedly, Anatoly Perminov told a government meeting Wednesday that the preliminary design could be ready by 2012. It would take about nine more years and 17 billion rubles (about $600 million or 400 million euros) to build the ship. This ambitious proposal is a stark contrast to the current state of the Russian space program. Perhaps the most worrying problem is the misconception that uranium is plentiful. The world’s nuclear plants today eat through some 65,000 tons of uranium each year. Of this, the mining industry supplies about 40,000 tons. The rest comes from secondary sources such as civilian and military stockpiles, reprocessed fuel and re-enriched uranium. “But without access to the military stocks, the civilian western uranium stocks will be exhausted by 2013, concludes Dittmar. But what of new technologies such as fission breeder reactors which generate fuel and nuclear fusion? Dittmar is pessimistic about fission breeders. “Their huge construction costs, their poor safety records and their inefficient performance give little reason to believe that they will ever become commercially significant,” he says.